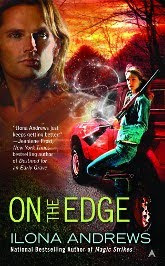 On the Edge by Ilona Andrews got my attention at hello. I started to read the first few pages just to get a feel for the book and that was it for me, I couldn't put the book down. The first section of this book is definitely an attention getter. The characters became all around favorites. I fell in love with our heroine Rose without question. I love her personality. Rose is a strong heroine, with a great sense of humor and a direct way of dealing with those around her that I just love. Although Rose has been toughened by her past experiences, she is still giving and caring to her brothers and her community. She has been used badly by her neighbors and isn't a pushover but when push comes to shove, her strong leadership, caring qualities and sense of responsibility comes to the forefront. Rose is powerful enough to take care of herself but appreciates help when needed, something I always admire in a heroine. Declan, the aristocrat who came from the Weird in a secret mission, is definitely the hero type. He knows his strengths and comes off as being charming, arrogant and full of himself at times. This makes for some great dialogue and situations between Rose and Declan that keeps this book more than interesting. I love that Declan is secure enough to recognize Rose's strengths and admires them, but doesn't feel insecure or threatened by her powers or her strength. I think the relationship he develops with Rose's brothers is lovely. I also like that even after he becomes enamored of Rose he is not a pushover -- the two of them become partners. The children in this book, Rose's brothers Georgie and Jack, are an integral part of the story. Both of them contribute not only to Rose's characterization but to the plot itself. Georgie with his big heart and his powers is a character that I want to see developed in future books. Jack is adorable and fierce and I'd like to see how he turns out in future. I love the way Rose's maternal instincts and every day life concerns are weaved into this tale of magic and of good vs. evil. The other secondary character I hope to see in future books is William. His is an interesting story I'd like to see developed. The world in this series is deceptively simple to explain. The Broken is a world without magic -- our world. The Weird is a parallel world to the Broken where all is done by magic -- one world doesn't know about the other. The people in these two worlds cannot see the boundaries between the worlds or cross over, with a few exceptions. The Edge is a strip that runs between these worlds and its inhabitants are aware of both worlds. Edgers possess some magic, although some are more powerful than others and they can cross the boundaries between the worlds. Most Edgers work and shop on the Broken. I kept thinking throughout the book... why are we the broken? It was explained that those who can pass through the unseen world boundaries lose their magic when they pass into our world and feel as if they are broken -- that's where the name comes from. The Edge where Rose lives with her brothers is like a fictional southern lawless mountain town where the folk carry on feuds and take care of justice their own way. The fact that Rose's magic is the strongest found on the Edge acts as a double-edged sword. She can take care of herself and her family by using it, but at the same time it makes her a target not only within the Edge, but for some of the aristocratic members of the Weird who can cross over. The plot was interesting and engaging from the beginning, I liked the way everything was revealed and not as easy to figure out as it first looked. There are twists and turns, evil magic-hungry creatures flooding the Edge and then uber-evil to fight, and Andrews excelled at putting this group of characters and this story together. If there's a complaint it might be that the end felt a bit like a fairy tale ending, but then I'm not quite sure how the next story will go... so, I'll wait and see about that. I thought this was an excellent, fast paced read, set in a creative world with great characterization. I could not put it down until I finished it. Rose is definitely a favorite heroine and On the Edge becomes the first of an exciting new series by Ilona Andrews I'll be looking forward to reading. You can find out more about the author here. I've heard of Ilona Andrews but haven't really paid attention to her books. I'm just now getting into reading urban fantasy so I'll be checking this out now. Aah, more books to the TBR! Leslie, I agree! I'm so glad to hear the news about William. I was hoping his would be the next story. Yay! 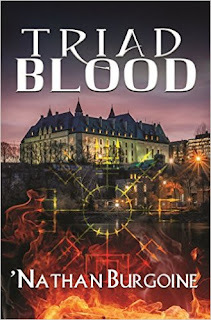 I'm a fan of Ilona Andrews' UF Kate Daniel series, and am so excited to see so many great reviews for this book! This is also UF and not paranormal romance, correct? Can't wait to read it. It is teetering toward the top of the TBR .... LOL! Christine, that's a good question. I put it down as UF, but I think this is more "fantasy/fiction" or "fantasy/romance"... the romance was definitely there, and the "urban" part of UF was not quite there in this book. (I have to fix my label). I know some Kate Daniels fans were a bit weary of starting this series, but it's different, unique and just as good. Andrews' writing makes sure of that. Thanks, Nath. I don't know... I guess we had different experiences with this one. For me it was a quick, fast paced read and I finished it in one sitting.